Speed up wall charging with the TU1152QCAC Quick Charge 2.0 USB Wall Outlet with Type A and Type C ports! Powered by Qualcomm-certified Quick Charge 2.0 USB ports, charging your Galaxy S6/Edge, Nexus 6, Droid Turbo2 takes 75% less time! Now is the time to add USB outlets with Quick Charge Technology to your home. 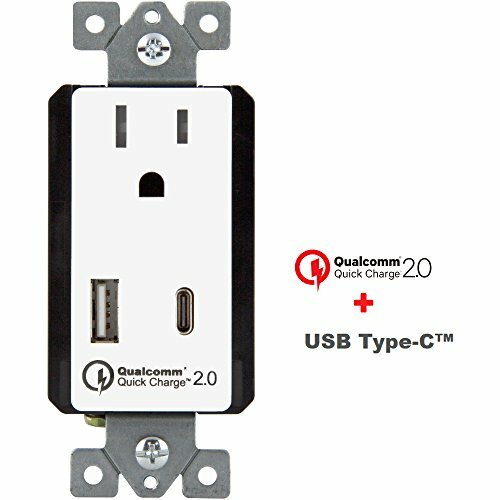 Two Quick Charge 2.0 USB Type A and reversible Type C port fast charges two devices simultaneously, reducing 75% charging time to QC2.0 smartphones, tablets and devices including Motorola Droid Turbo 2, ZTE Axon Pro, Sony ZXperia Tables, Blackberry Priv, LG G Flex2, HTC One M9, Moto Z, Nexus 6, HTC Desire Eye, more from Qualcomm® QC2.0 device list. In 30 minutes, this USB C wall outlet finishes 60% power charging, as compared to 12% power charged by a conventional charger. This type-C USB outlet also works with non-Quick Charge devices, such as the iPhone, iPad, etc. Both USB ports recognize the power needed of connected devices and maximize the charging efficiency allowed by the device up to 2.4A per port. Less time charging, more time doing. The TOPGREENER Quick Charge 2.0 USB charger outlet replaces standard wall outlets using the same wiring. Back and side wired for easy installation. Three interchangeable face covers (white comes attached, black, light almond) included provide easy color changes without having to replace the entire unit. One USB C cable included in package.